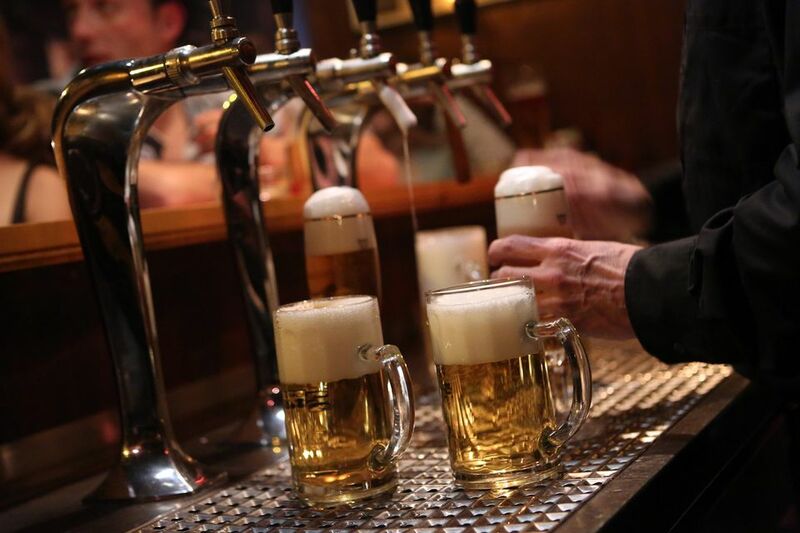 Germans have been brewing beer for over 2,000 years. Today, you can try over 5,000 different brands, handcrafted in 1,300 breweries, all over the country. Visit a kneipe (traditional beer pub) in Cologne and you'll probably only find one beer on the menu: Kölsch. Meaning "of Cologne", locals are proud of their beer which is brewed exclusively in the Cologne region. The pale, crisp, and light-bodied kölsch is served in a thin, cylindrical glass called stangen. They are only 7 ounces and it is a tradition that kobes (beer pub waiters), clad in blue shirt, dark trousers and apron, will bring you one kölsch after the other on their kranz (tray), unless you leave your beer glass half full or cover it with your beer mat to let them know you are done. This means kölsch is always cold and rarely flat, but even these little beers can pack a punch at 5 percent. The waiter will keep a running tab so you can both keep track on the beer mat. Bavaria has more breweries than any other region in Germany – you can find more than half of the country’s breweries here, which translates into many great beer styles. The Bavarian brew you must try is the most famous and original wheat beer: Hefeweizen (literally “yeast wheat”). Easy drinking, this cloudy wheat ale is topped by a white foamy head, whose fruity aroma is reminiscent of citrus, bananas, and cloves. It is usually served in a shapely 500 ml vase-shaped glasses and the two main varieties are weissbier ("white beer") and witbier (Dutch for "white beer"). For true fans, make the pilgrimage to Weihenstephaner Brewery. This Bavarian institution is the oldest continuously operating brewery in the world. Düsseldorf is the city of altbier, a German style brown ale. “Alt” means old, and the name refers to the pre-lager brewing method of using warm top-fermenting yeast like British pale ales. The best place to try your hoppy "alt" is in a traditional beer pub which brews its beer on premises. Look out for pubs like "Fuechschen", "Schumacher", "Schluessel", or "Uerige" in Düsseldorf’s Altstadt (Old Town). The perfect summer beer in the German capital is Berliner Weiße. It is a light and sour wheat beer, which is sweetened by a shot of himbeer (raspberry) or waldmeister (woodruff-flavored) syrup giving it a candy-colored red or green color. Back in the days, Napoleon’s troops called this popular drink the “Champagne of the North”. Though Berlin is at the forefront of craft beer in Germany, Berliner Weisse is still a biergarten (beer garden) favorite today. It is served in a stout or bowl-shaped glasses, and it is best to drink this low-alcohol and refreshing beer with a straw. The small town of Bamberg in Franconia (Upper Bavaria) is home to many historic breweries and its famed amber-colored smoked beer, rauchbier. The secret of this beer’s mild smoked flavor is the century-old process of drying malt over an open fire made from beech wood logs. While other cities produce rauchbiers, it is Bamberg that is famous for them. Try the beer from Schlenkerla and Spezial in Bamberg. Their smoked beers are still made the traditional way and only sold within a 9 mile radius of the city. Leipzig, the capital of Saxony in the East of Germany, is home to the distinctive Gose beer. This unusual beer is spiced with coriander seeds and - unlike any other German beer - it is brewed with lightly salty water and features a sourness. Its tart and crispy taste and moderate alcohol content (4 to 5% ABV) make it a refreshing summer beer. Gose is often paired with seafood and can be enjoyed at Leipzig's best restaurants. Gose is also unique in traditional German beers in that it does not comply with the reinheitsgebot (beer purity law). It is allowed an exemption as it is a regional specialty. Even though it has been brewed since the early 13th century, it had fallen out of favor until recently. Now, it is making a comeback in Germany and abroad.